3 Nights’ accommodation for the lion hunting client. The trophy fee of the lion that was booked. All food, non-alcoholic drinks and refreshments. Hunting vehicle and fuel for 2 days. Extra days or extra vehicles are USD 100 per day. Trackers, skinners, cook, camp staff. Field preparation (skinning and salting of trophies) included. All necessary paperwork like PH registers, transport permit to your taxidermist. Taxidermist will then apply for CITIES permit and export documentation. Transport of trophy to international destination. Personal and medical insurance Curio purchases. A deposit of 50% on the full rate is required to confirm any booking. 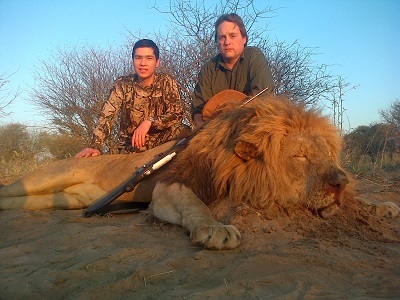 A deposit will be forfeited should the booking be cancelled less than 60 days before the commencement of the hunt. The balance is paid 30 Days prior to arrival. All animals killed or wounded would be charged for.